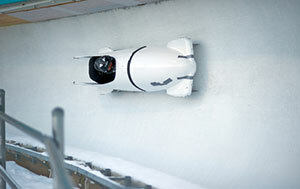 USADA announced today that a three-member panel of the Court of Arbitration for Sport (CAS) has rendered a decision in an expedited appeal in which USADA challenged the determination regarding degree of fault, sanction length and sanction start date in the case of bobsled athlete, Ryan Bailey, of Sherwood, Ore., set forth in a decision in Mr. Bailey’s case issued by the American Arbitration Association (AAA) on August 23, 2017. Mr. Bailey’s case was expedited for resolution in advance of team selection decisions related to the upcoming Winter Olympic Games. The CAS award sets aside the AAA decision, instead imposing a two-year period of ineligibility for Bailey’s anti-doping rule violation, as opposed to the six-month period of ineligibility determined by the AAA. Bailey will receive credit for a provisional suspension served between January 29, 2017, and July 9, 2017, towards his two-year sanction. Based on the CAS decision, Bailey’s competitive results obtained on and subsequent to January 10, 2017, will remain disqualified, including his first-place result from January 10, 2017, in the 2-man bobsled event, and his sixth-place result from January 12, 2017, in the 4-man bobsled event at the International Bobsleigh and Skeleton Federation (IBSF) North American Cup. Bailey, 28, tested positive for 1,3-dimethylbutylamine (DMBA) as the result of an in-competition urine sample he provided on January 10, 2017, at the IBSF North American Cup. DMBA is a Specified Substance in the class of Stimulants and prohibited in-competition under the USADA Protocol for Olympic and Paralympic Movement Testing, the United States Olympic Committee National Anti-Doping Policies, and the IBSF Anti-Doping Rules, all of which have adopted the World Anti-Doping Code and the World Anti-Doping Agency Prohibited List. The CAS Panel’s award confirms the fundamental principle that athletes must maintain heightened awareness, at all times, of their anti-doping responsibilities, both in and out-of-competition. The two-year sanction determined by the Panel is standard for those who choose to use, in close proximity to a competition, an over-the-counter dietary supplement marketed for performance enhancement and labeled with a prohibited substance. In this case, Mr. Bailey used such a product listing a prohibited stimulant on the label of the product without apparently even looking at the label. Consequently, USADA’s appeal was required to uphold the fair, consistent and predictable application of the rules for all athletes. USADA and the FDA have issued past warnings and education specifically about DMAA and DMBA, and other prohibited stimulants, in dietary supplements, highlighting the dangers of a positive anti-doping test and/or adverse health event. Athletes in the USADA registered testing pool are regularly advised of the increased level of due diligence necessary to evaluate claims related to these products and of the risks of a positive anti-doping test and/or an adverse health event. 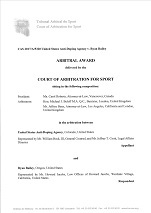 The CAS award, as well as other arbitral decisions, can be found here.